Follow the planting and care tips on how to grow beets organically in garden beds or containers, outdoors or indoors. Beets are not only very easy to grow but are also extremely healthy. They are almost completely edible, the greens are excellent in salads and cooked as vegetables and the beetroots can be eaten in salads or pickled. Beet's Botanical name is Jacqueline Courteau. It is also known as Chukander in Hindi and garden beet, sugar beet, Swiss chard, blood turnip, spinach beet, common bett, juurikas, betteraves, rübe, biatais, barbabietola, beterraba, remolacha, betor, biet, palanki, paleng sak in different languages and countries. Beets grow well in cool weather when the soil temperatures reaches between 7°C and 25°C. In USA, it can be grown in USDA Hardiness Zones: 2, 3, 4, 5, 6, 7, 8, 9, 10. Plant in full or part sun. The plants can survive frost and almost freezing temperatures. In Australia, they can be planted almost the whole year. Beets come in all kinds of sizes, shapes and colors - deep red, yellow or white bulbs. I have grown round as well as long beetroots in my garden. Beets grow well in a soil pH above 6. Dig the ground tom a depth of 10 to 12 inch and remove any rocks and pebbles, break big chunks of soil. If the soil is clay mix some river sand to make it free draining. Beets require good nutrition to germinate. Mix lots of organic material like compost and aged manure to amend the soil. Beet Seeds, Seedlings or Cuttings? Beets can be grown from seeds and seedlings but not from cuttings. Planting direct seedling in the garden is the easiest way to grow beets. Soak beet seeds in water for 24 hours before planting to aid germination. Plant seeds 1/2-inch deep, 2 inches apart if growing for greens, 3 to 4 inches apart if growing for the roots (but you can still harvest the greens, too). If you want a smaller, continuous harvest, sow seeds every two weeks. Each beet seed is actually a dried fruit made up of 2 to 6 individual seeds, so they will sprout very close to each other. Thin when the seedlings are about 2 inches high by pinching them off gently using scissors, leaving the best looking one in each cluster. Do not pull them out of the ground, it may disturb the close surrounding roots of nearby seedlings. Mulch with sugarcane mulch or any other organic mulch to contain moisture and discourage weeds. Water well to maintain plenty of moisture. If planting in a container and indoors, place the pot near a window where it can get plenty of sunlight. Too much nitrogen will produce small size beetroots but produce lots of greens. A balanced liquid fertilizer is good. Beets require good amount of phosphorus in the soil to produce large roots. A side dressing of bonemeal or rock phosphate will improve the size. Beet plants are attacked by leaf miners, flea beetles, leaf hoppers and Mexican bean beetles. I spary neem oil spray to get rid of pests. You can cover the newly plants with a floating cover and leave it in place until harvest. Beets are ready to be harvested between 50 and 70 for most varieties. I pinch a few leaves and use them in salads, these are more nutrition than the roots. I harvest them when I see that the leaves have grown to a good size. For larger bulbs you have to wait longer, but if you leave your plants longer in the ground, the bulbs become hard and woody. I harvest bulbs 2 to 3 inches in diameter for optimum flavor, tenderness and taste. Fresh beets can be stored in the refrigerator for about 7 days. Cut off leaves leaving one inch of stem on each beet to keep them from bleeding. The clipped beets will keep fresher for longer. Put them in a plastic bag and store in fridge. They remain good for about a week if stored this way. 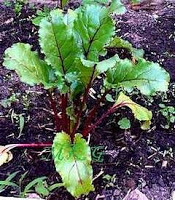 Good compatible plants for beets are Cabbage, Corn, Dill, Dwarf Beans, Lettuce, Onions, Peas, Radishes and Silverbeet.